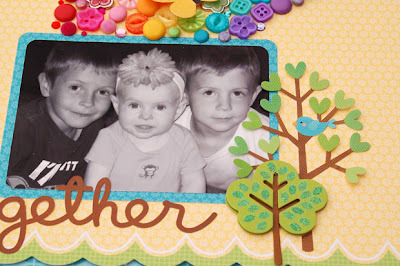 Doodlebug Design Inc Blog: Mix & Match Week Begins!! Welcome to our first Doodlebug Mix & Match Week! We are going to mix up the product and show you how perfectly it matches. Our team text extra care to make sure that product you bought last year still coordinates with products you bought yesterday. We're going to show you how to take a great mix of product throughout this week and inspire you to match our creativity!! Let's get started by showing off one of my favorite projects from our Design Team that was sent to us from Tiffany Hood...be sure to comment if you love what she created!! This layout was a ton of fun to make. I wanted to do something to showcase Doodlebug's beautiful core colors. For this layout I used products from the Welcome Home, Santa’s Workshop, Colorwheel, Nifty Notions, Cake and Ice Cream, and Mother Nature collections as well as products from Doodlebug’s core collections of buttons, brads, and word stickers. I love how everything from every collection coordinates! For this layout I used products from the Welcome Home, Santa’s Workshop, Colorwheel, Nifty Notions, Cake and Ice Cream, and Mother Nature collections as well as products from Doodlebug’s core collections of buttons, brads, and word stickers. Your creation is a big favorite for me! It gives all plenty of ideas to make beautiful creation like yours! Ohmyheavens, BEAUTIFUL. I love how you used all the buttons and brads to make the rainbow, but it does not distract from that cute photo. Just awesome!! LOVE the raimbow!!!! Love it!! Would love to frame a project like this! Wow! That is a stunning rainbow! Okay, don't get me wrong, this is GORGEOUS, but wasn't it practically PAINFUL to use up all of those embellishments!?! haha. I'm such a hoarder! This is SO pretty!!! Well done! I love that rainbow...it is gorgeous. Fabulous idea, Tiffany! 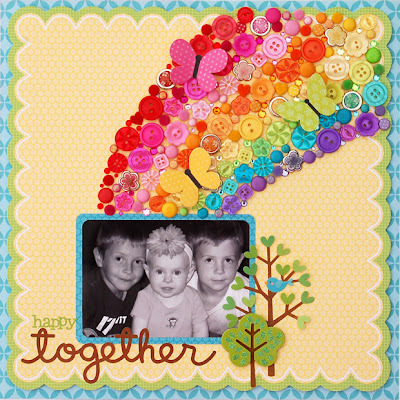 I just loved the buttons rainbow, thanks for sharing! This is all kinds of wonderful! I'm so glad that rainbows are so popular right now because I just can't get enough of them!!!! Thanks for sharing an amazingly creative rainbow today!!! I love the brightness of this project. 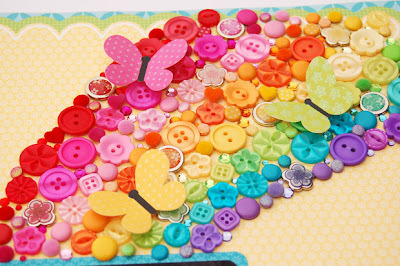 The buttons and butterflys are so cute. Makes me feel like it's spring already.